Notes: Jun. 1975←Jul. 1975→Aug. 1975 Vol. 36, No. 6. Incorporating Worlds of If is printed in the publication data on the table of contents. 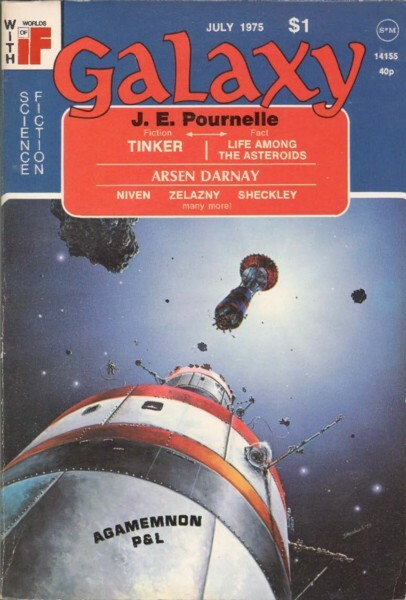 Cover illustrates "Tinker". Artists listed in table of contents: Fabian, Freff, Gaughan, and Sternbach. Individual works identified by signatures. "Syncope and Fugue" is a short excerpt from a novel by Robert Sheckley, "Options." Also published in the United Kingdom by Universal-Tandem Publishing Company, Ltd. This is the last issue with a dual US/UK publishing arrangement. Jon Des Cles is listed as Jon DeCles in the table of contents.